The aortacarries oxygen-rich blood to the body. 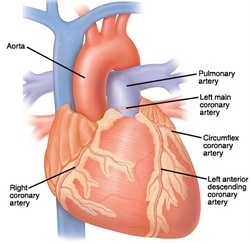 The right coronary artery supplies blood to the bottom, right side, and back of the heart muscle. The pulmonary artery pumps blood to the lungs. The right atrium receives blood from the body. The tricuspid valve prevents blood from returning to the atrium. The right ventricle pumps blood to the lungs for oxygen. The heart’s electrical system is made up of nodes and pathways. The left atrium receives oxygen-rich blood from the lungs. 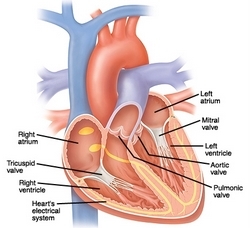 The mitral valve prevents blood from returning to the atrium. The left ventricle pumps oxygen-rich blood to the body. The aortic valve prevents blood from returning to the ventricle. The pulmonic valve prevents blood from returning to the ventricle.